The near-full moon makes it tricky, but there’s a nice window right before sunrise on Monday morning. Specifically, take a peak Sunday night around 4am. As long as the sky is clear (the forecast in Connecticut looks great! ), you should see a nice show of about 25 meteors per hour. The radiant (where the meteors appear to originate from) are near the constellation Orion — hence the name of the meteor shower. Check out the accompanying image, published by Space.com. Tip: Go outside about 15 – 20 minutes before “prime time” watching, so that your eyes can properly adjust to the dark. At the recent Connecticut Entrepreneur Awards — out of 49 incredible nominees — I was selected by public voting for this amazing award. I’m honored, as it reflects the appreciation of my career by my peers. The icing on the cake: I was able to celebrate accepting the award with my parents, sister, and wife. It just doesn’t get any better. Thank you, everyone. Your thoughts and energy — and lifelong friendships — inspire me daily. Read the complete SPACEFLIGHT NOW article here. This Sunday night, December 3rd, the Moon will appear bigger and brighter than what you normally see. It’s because, on the day after, it will make its closest approach to Earth for the month: Just 222,443 miles. The best view of the Supermoon will be as it rises just after sunset. It’s a nice educational experience for the whole family. Click here for a great article by National Geographic. “SpaceX Founder and CEO Elon Musk says he plans to send a spacecraft to Mars in five years and put humans on the red planet in seven years. Musk laid out his ambitious goals at the International Astronautical Congress in Adelaide, Australia on Friday. ‘Build up the base, starting with one ship, then multiple ships, then building out the city, then making the city bigger and even bigger,’ Musk told the crowd. His goal is to make humans a multi-planetary species. ‘It’s about believing in the future and thinking that the future will be better than the past, and I can’t think of anything more exciting than going out there and being among the stars,’ he said. The key to his project is a large rocket and spacecraft, code name BFR. I was honored and privileged to be part of Ky “Rocketman” Michaelson’s extraordinary quest to launch the world’s first civilian rocket into space — which we accomplished on May 17, 2004. And I feel honored, again, to help Ky and his production team bring this amazing American story to life. Please visit the Indiegogo link below to see how you can help launch the ROCKETMAN documentary movie. You can receive all sorts of perks for participating — including memorabilia that flew into space on our historic mission. Even get “co-producer” credit in the film. Join us. The sky is (not) the limit! F.Y.I. : On a personal note, it’s neat to see me in the clips that make up the Indiego intro video. It brings back great memories of such an important part of my life. CLICK HERE — http://igg.me/at/rocketmandoc — or on the image above to help launch this extraordinary movie. Governor Malloy and other State of Connecticut officials just visited reSET – the place where I hold my Entrepreneur-In-Residence office hours. They came by to see, first hand, the many innovations and entrepreneurial activities happening here. We are — indeed — building an innovation economy in Connecticut. It’s fun to show off our entrepreneurs! And, yes, for all you eagle eyes: That’s me in the poster. LOL. A virtual cameo…. Click here to view an excellent article on the news from FORTUNE. Image courtesy of FORTUNE / Getty Images. By Maddie Stone / GIZMODO: This morning, the Internet erupted with rumors that physicists have finally observed gravitational waves; ripples in the fabric of spacetime predicted by Albert Einstein a century ago. While it isn’t the first time we’ve heard excited whispers about the elusive phenomena, the gossip feels more promising in light of the recently upgraded detector at the Laser Interferometer Gravitational Wave Observatory (LIGO) that’s behind all the hubbub. Discovering gravitational waves would be a huge deal for physics, cosmology, and our understanding of the universe at large. But if you’re not a scientist studying one of the aforementioned fields, it’s possible you’ve never heard of these mysterious ripples. What the heck are gravitational waves, and why have physicists been struggling to find them for a century? Moreover, why should we care? 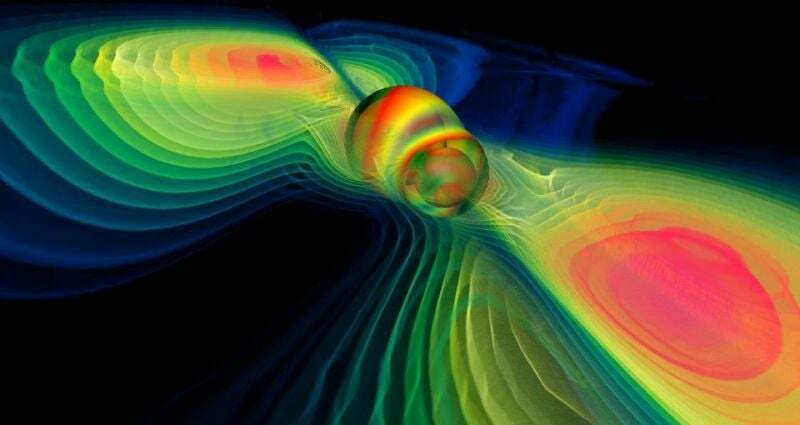 Simply put, gravitational waves are vibrations in the fabric of the universe—light-speed ripples in spacetime itself, caused by such epically violent events as exploding stars and black hole mergers. Thanks to inconceivably large, violent, and distant celestial happenings, the atoms that make up everything from the stars in the sky to the human beings on Earth are shaking a tiny bit, all the time. And by tiny I really mean tiny. For all the energy that goes into producing gravitational waves, spacetime ripples themselves are incredibly faint. Physicists estimate that by the time gravitational waves reach Earth, they’re on the order of a billionth the diameter of an atom. You need ridiculously precise instruments operating in completely noise-free environments to measure them, and until very recently, our detectors simply haven’t been up to snuff. But the gravitational wave detection game’s been changing of late, with a recent spate of improvements to our leading ground-based observatory, LIGO, and with the launch of the very first space-based gravitational wave detector, LISA Pathfinder. Armed with these two science laboratories, physicists are hopeful that we’ll be able to measure our very first spacetime ripples by the end of the decade. Now, it’s looking like that day might come a lot sooner. My wife Elsie & I treated ourselves to this gizmo when it was on sale a few months ago on Black Friday. And it’s ridiculously fun! It’s the first generation on the path towards a Star-Trek-like computer in every home. It goes by the name Alexa. Today I asked: “Alexa, how’s it hangin’?” It responded: “I’m great! And ready to help.” LOL! You can ask it to play any music stored in your Amazon collection. (The audio is awesome for such a small device.) You can ask it to tell you jokes. You can ask it to search for anything on the Web. You can dictate on-the-fly shopping items that get synced to your phone. It streams Pandora and other online music services. It can wake you to music. It can tell you the weather forecast. It follows you favorite sports teams — and provides updates. It streams news. Provides restaurant recommendations. Gives you traffic reports. Can read to you ANY book in your Amazon collection. AND, when you stop the audio reading and pick up your Kindle, your digital book is synced to where Alexa left off! Granted, a lot of these are just geeky fun things. And services like Siri do a few of these items. But — wow — it’s darn fun. Plus the physical engineering design and user interface are brilliant. Click on the accompanying graphic to see details of the device and some of the things it can do. And — if you can catch it on sale — it would make a really nifty gift for you or a loved one. Check out the following excellent article from NBC News, with videos of the takeoff and landing, at this link. “Let’s start with the facts: Yes, there’s something hurtling through space in our direction. Yes, it’s going to enter the Earth’s atmosphere and possibly land in the Indian Ocean next month. No, scientists don’t know quite what it is. And, no, that doesn’t make it a UFO. But ESA scientists have a pretty good idea of what it could be — probably a remnant from a past mission, like the hollow shell of part of a spent rocket — and they’re confident that it’s unlikely to be a threat. 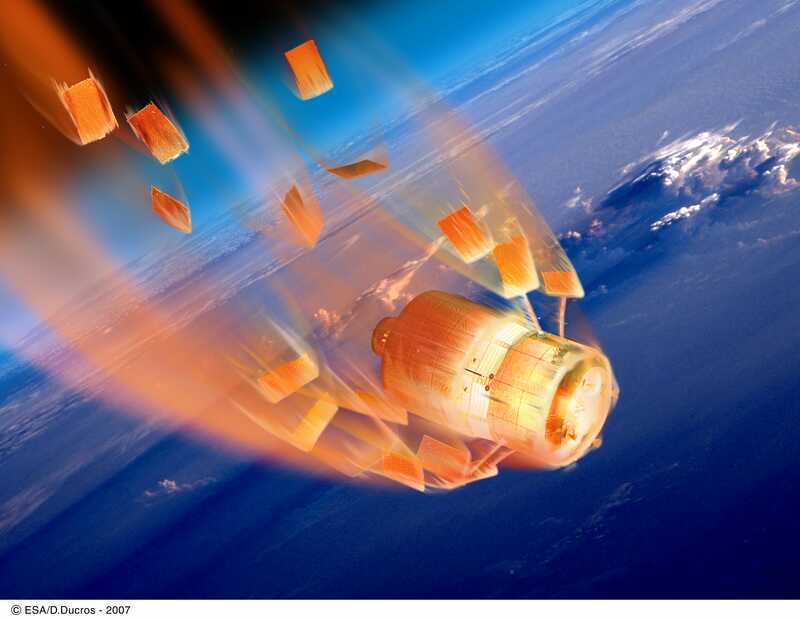 ‘The expected 13 November reentry of what is likely to be a rocket body poses very little risk to anyone,’ they wrote on the ESA blog Thursday. ‘The object is quite small, at most a couple of meters in diameter, and a significant fraction if not all of it can be expected to completely burn up in the atmosphere,’ said Tim Flohrer, from ESA’s Space Debris Office in Darmstadt, Germany. For the complete article, please visit, the CBS Interactive Inc. page at this link. Read the full article, by The Christian Science Monitor, at this link. 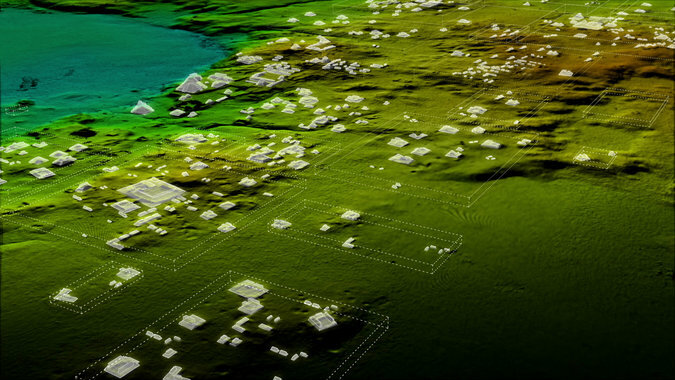 Image courtesy of the University of Sussex. As I mentioned in my statement to the press, I made the decision with my company to forgo patent licensing fees for R&D. This is too important of an innovation to keep it bottled up or to inhibit the early stages of medical research. Too many people are suffering. Too many people are dying. Alzheimer’s Disease is an incurable disease that affects 5.3 million people in the U.S. and nearly 44 million worldwide. My patented technology is based on years of research by scientists regarding the effects of radio waves on the human brain. Recent studies exposed RF energy to mice that have been genetically modified to exhibit Alzheimer’s disease. Mice and humans share 95% of their genes, providing an appropriate reference for comparative studies. For more information, including research references, the patent, the full press announcement, and links to TV, radio, and other media / new reports, please visit www.AlzheimersTreatmentInvention.com. You saw it on the news. You read about it in the press. But now you can learn the inside story of the team that launched the world’s first civilian rocket into space. As many of you know, I was one of the team leaders of this historic mission. On May 17, 2004, after years of agonizing rocket crashes and catastrophes — some quite spectacular — we accomplished our remarkable goal. I stuffed the book with 90 full-color photos to bring the adventure to life in vivid detail. It’s 244 pages long in a wonderfully oversized 6×9 format. (Paperback size wouldn’t do justice to the glorious color images.) Check out the covers here. I encourage you to check out my book’s companion Web site at www.TheNewRaceToSpace.com. You’ll see lots of interesting videos and other neat stories. Entrepreneurs rocked the house last night at Stamford’s historic Palace Theatre. The Shark Tank-style pitch competition featured Connecticut-based entrepreneurs and startups. Kudos to these creative minds that help power our State’s backbone of business innovation. A teenager’s view on social media. Insightful. In this article by Andrew Watts, posted on medium.com, a teenager describes his age group’s opinions of various social media. Read his opinions about Facebook, Instagram, Twitter, Snapchat, Tumblr, YouTube, Google+, Reddit — and more. I learned a bunch. I bet you might, too. Click here to check out the article. Enjoy.